I have grave concerns over how the current proposed Nutrient Management regulations are being mandated to the agricultural industry in Maryland. As both an equestrian facility operator and a Montgomery County Soil Conservation District Supervisor, I can see both sides of how these regulations will affect not only my farm, but the entire equestrian industry in Maryland. From my farm side, I am deeply disappointment in Maryland’s Department of Agriculture (MDA) and their lack of support for the family farm. During the summer, I attended several meetings where farmers were assured that “nutrient trading” would be a great benefit to us and would help us achieve the more costly Best Management Practices (BMP’s) on our farms. This trading is where developers are required to offset their new construction based on the environmental impact and it was touted that farms could benefit as the source of the offset. Now, we are being forced through MDA’s Nutrient Management requirements to comply and we lose all ability to have these same BMP’s available for the nutrient trading. In essence, we were told one thing and MDA did another. On top of that, MDA made no attempt to quantify the economic impact this would have on our farms and, let’s face it, our businesses. Our livelihood is from being able to make a profit, just like any other business. Placing these regulations on our businesses puts us at a serious economic disadvantage to other farms not required to follow these standards in the watershed. In their notice to the public, MDA stated, “The proposed action has minimal or no economic impact on small businesses.” Really? So I put on my Soil Conservation hat and the farm was reviewed for the cost of what it would be for fencing out streams to keep the horses out of water they don’t go into. The estimated cost was $50,000 to address a non problem. And this didn’t account for additional upkeep or the fact that this fence isn’t going to keep out the deer that regularly go into the streams. Why isn’t the state addressing the serious overpopulation of deer that have a devastating economic impact, as well as environmental impact on the state? I also have concerns that agriculture, and especially equine operations, are being targeted with these new nutrient management plan requirements. The goals set for just Montgomery County is 1,002 acres of stream access control with fencing by the year 2025. Since our county has relatively few cattle operations, the majority of this one regulation will fall on the equine operations to comply. My family has been farming for generations. We protect our lands and each generation tries to improve for the next generation. We use scientifically-based practices and work hard to keep our farm active and profitable. Requiring farms in Maryland to comply with stringent regulations that are not based in fact and/or science and moving away from incentives to punishment are counterproductive. By putting additional economic burdens on farms, it will only hasten the demise of agriculture in Maryland. If that’s MDA’s goals, then I guess we’re headed in the right direction. We want to know what you think! 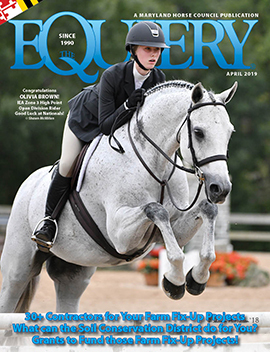 Post your comment below or e-mail editor@equiery.com. NextSpreading the manure & stream fencing: will Maryland horse farm owners become outlaws? 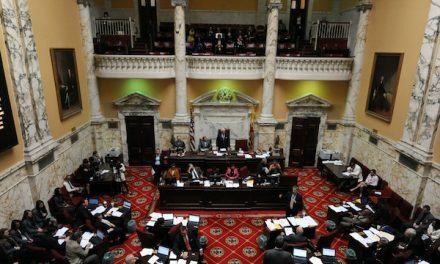 Howard County delegation to debate permitting Sunday hunting on private land.